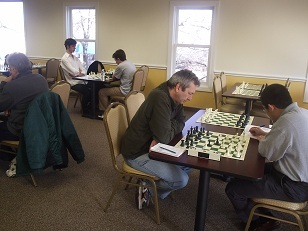 On Saturday, the CCFC was the scene of two sections of Quads in which ten players fought hard and well for each point. In the first section, Nelson Castaneda emerged victorious with a perfect 3.0 after defeating National Masters Daniel Lowinger, Oliver Chernin and Ian Harris. Lowinger had to settle for second place after a draw against Chernin, and a victory over Harris. Chernin also managed a draw against Harris for third place leaving Harris to bring up the rear. In Section 2, Sam Barsky emerged victorious with a perfect 3.0 after defeating Jeffrey Peterson, Brian Arpie, and Ethan Segall. Sharing second place were Segall and Arpie with 2 wins each to soothe their defeat by Barsky. Peterson managed a victory over Justin Blum and Blum, in turn, defeated Leo Bykhovsky to round out the day. Of note is the fact that both Arpie and Blum were unrated going into the day’s tournament and more than held their own. Well done, gentlemen!